The Trujillo/Cajamarca region in the North. 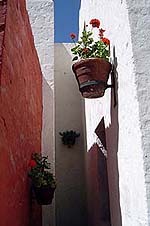 The “Callejón de Huaylas” north of Lima (trekking, mountain climbing). The Pisco (Paracas Reserve, Ballestas Islands)/Nazca area south of Lima. The Cusco (Machu Picchu/Sacred Valley) region in the central-southern part of the country. The Puno/Lake Titicaca area in the southern highlands. The lowlands/Amazon basin (“selva”), i.e. the National Parks (Manu, etc.) and Natural Reserves. The Arequipa region in the South (including the Colca Canyon/Cotahuasi Canyon). 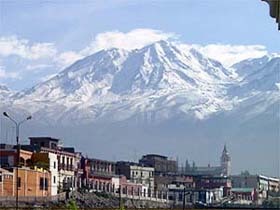 The “Departamento de Arequipa” (63,345 km2, with approximately one million inhabitants) is located in the south-western part of the country. It is bordered to the north by Ica, Ayacucho and Apurímac, to the south by Moquegua, to the east by Cusco and Puno, and to the west by the Pacific Ocean. 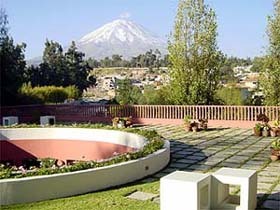 The ultimate advantages of Arequipa as the ideal venue to learn and practice Spanish are its unique urban atmosphere and its year-round beautiful weather (occasional rain showers and overcast skies may occur between January and March). Its moderate altitude (2330 m/7.644 ft.), considerably lower than Cusco (3330 m/10,827 ft.), is such that it should not cause any “soroche” (altitude sickness). And not to forget: there are few places in the Hispanic world where Spanish is spoken as beautifully and as correctly as in Arequipa. 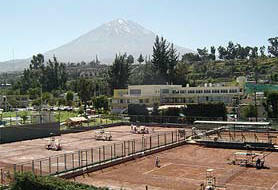 Arequipa is located at a height of 2,330 m (7,644 ft.) in a green oasis in the western foothills of the Southern Andes. In (re)constructing the town in the second half of the 16th and the 17th century, the Spaniards used “sillar,” a pearl-white volcanic building material which, when hit by the sun’s light, produces a glimmer or glow, thereby causing people to refer affectionately to Arequipa as “La Ciudad Blanca” (“The White City”). 1. Long ago the Aymara Indians settled here. In their language (Aymara) “ARI” stands for “summit” and “QUIPA” for “laying behind.” Indeed, seen from the Lake Titicaca region and the “Altiplano,” Arequipa is located behind the majestic volcano Misti. The Spaniards redesigned and (re)constructed the city in accordance with their own taste and architectural concepts, beginning on 15 August 1540. The result is one the most charming colonial towns in the Americas. The 15th of August is still celebrated in various festive forms within and around Arequipa through carnivals and fairs for an entire week. The climax of the festival takes place in the evening of the 14th of August with a splendid firework display on the Plaza de Armas. The wide façade and steeples of the impressive cathedral, and two story arcades that grace the other three sides with palm trees, old gas lamps, and a white stone fountain nestling in an English-style garden, make Arequipa’s Plaza one of the most beautiful colonial Main Squares in the New World. El Misti (the Gentleman, 5822 m/19,101 ft) is not the only volcano around Arequipa, but it is the most famous and elegant, and lies between two other volcanoes, the Chachani (the Beloved, 6057 m/19,872 ft) and the steep Picchu Picchu (the Top Top, 5664 m/18,583 ft). The pressure between the tectonic plates of South America and the Pacific Ocean has created memorable dates in Arequipa’s history: in 1687 and 1868 earthquakes damaged a large number of historical buildings in the city, including the Cathedral, which was damaged for a second time on 23 June 2001. In the city’s historic centre you can admire a wholly “arequipeño” architectural style. Formed towards the end of the 17th century, it is a blend of Italian baroque, Spanish silver-plating, and Andean creativity. 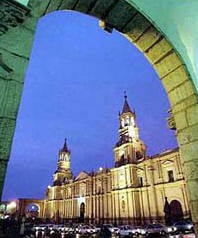 It is no wonder that since the year 2000, Arequipa is listed as a UNESCO Cultural Patrimony of Humanity. Locals and tourists with or without a guide can freely visit the parts that are open to the public. Everything has been beautifully renovated and the little streets and squares are full of colourful flowers and the walls are painted in fresh tints. Narrow alleys bring you to the different parts of the convent, passing through picturesque squares and odd living rooms with original furnishings on the way. Many people can still smell the atmosphere of the dark Middle Ages when visiting the dining hall, the square where nuns did their laundry, the washing hall and the extensive library with an incredible collection of books. Unfortunately the library is not always open to the public. Besides the Convent of Santa Catalina, there are other masterpieces of religious architecture worth mentioning, among them La Compañía (Jesuit Church) with the Ignacio Chapel, the Franciscan convent La Recoleta, the Church and Monastery of La Merced, and the San Francisco Plaza, all encompassing a 16th century colonial architectural complex. Apart from religious monuments, Arequipa displays beautiful colonial buildings from both the 17th and 18th century, of which the most important are the Casa del Moral, the Casa Tristán del Pozo, the Casa de Irriberry, the Casa del Pastor, and the Casa Goyeneche. Some of them are still private property; but most have either been sold to banks or been reconstituted as shopping malls and hotels. Some of these fantastic colonial houses can still be visited. Pay special attention to the perfect workmanship, the gardens, and the many statues and frontons. Former picturesque satellite towns have been incorporated into Greater Arequipa, such as Yanahuara (at 2 km from the Main Square), famous for its churches built in Andalusian style, and Cayma (at 3 km), well-known for its picanterías (typical local restaurants featuring spicy “creole” cuisine), its beautiful 17th century main church, and an extraordinary panoramic view of Arequipa. In the outskirts of the city, you’ll find fascinating villages with stepped terraces dating from pre-Inca times that are still used today by farmers from the districts of Chilina, Socabaya, Paucarpata, Characato, and Sabandia. Other attractions are the Yura, Socosani, and Jesus thermal baths. Two of the world’s most spectacular canyons are found in the Departamento de Arequipa: Cotahuasi, in the province of La Unión, and the Colca Canyon, in the province of Cailloma. The latter is more than 100 km inlength, while its depth begins near the village of Chivay, achieving its deepest point at 3269 m/10.725 ft. 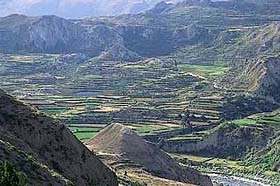 The Colca area is very well-suited for the practice of technical sports such as rafting, kayaking, and trekking. A series of Arequipa based tour operators offer reasonably priced two days packages to the Colca Canyon, including transport, hotel accommodations (with breakfast) and tour conducting (USD 25.00 to 60.00 per person, depending on hotel’s rating). The EDEAQ will help you to get you a suitable arrangement in terms of schedule and budget and will inform you about possible special offers. The Cotahuasi Canyon, the deepest in the world with 3354 m/11.004 ft., is almost twice the depth of the Grand Canyon in the United States and it extends from the foothills of the snow-capped Solimana up to the confluence of the Cotahuasi and Ocoña Rivers. It is situated at 379 kilometres from Arequipa, a 12-hour drive approximately. The road is full of a great variety of sceneries that increase its beauty thanks to the vigilant presence of the snow-capped Coropuna (6377 m/20.922 ft., Peru’s highest and largest volcano) and Solimana (6093 m//19.990 ft.). Visiting the Cotahuasi Canyon requires at least four, probably five days (round trip from/to Arequipa), but it is definitely worthwhile. The EDEAQ will provide advise how you can organise your trip to one of the greatest natural wonders on the planet. In Cotahuasi village, simple family-run guesthouses plus one small hotel as well as rustic restaurants offer their price worthy services to otherwise rare visitors. On the way to the Cotahuasi Canyon, do not miss a visit to the spectacular Valley of the Volcanoes (Andagua region). It is an impressive National Sanctuary, which consists of a valley and more than fifty small volcanoes of different sizes, all of them formed during the Quaternary Era, offering a unique natural landscape. This additional pattern will require three additional travelling days. 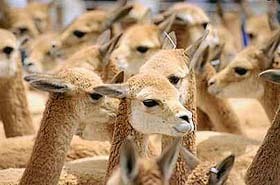 The Salinas y Aguada Blanca Reserve is one of the principal reserves dedicated to the reproduction of the vicuña population, which is a thin American Camelidae possessing the finest fur used in the highest quality textiles in the world. The Pampa Cañahuas (a National Reserve, formed by extense plains, created to protect the natural species of the region, especially thousands of vicuñas), the Sanctuary of Mejía Lagoons (created to protect the natural habitat of the regional fauna, it is one of the most important stations for migratory birds in the Peruvian Coast), the beaches of Mollendo (Mejía in particular), as well as the Camaná and Puerto Inca beaches are all fascinating places worthy of a visit. 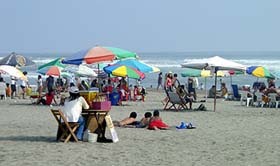 – Note that the beach season is between mid-December and early April. The school always makes its students aware of cultural and other events taking place in Arequipa and publishes once or twice per week a handout listing local cultural events. Sample copy (19 September 2012): click here. – Please be aware that during the summer holidays (January, February, and early March), the frequency of cultural events is fairly low. The EDEAQ can provide its students with short-term memberships in the well-equipped “Club Internacional Arequipa”, a first-class establishment with the most diverse offer in town (outdoor and indoor swimming pools, gym, tennis courts, etc.). The spacious sports and social club facilities are located in a small green valley between the city centre and the Yanahuara District and can be reached from the School (city centre) in about 15 minutes on foot or by taxi (between S/. 5.00 and S/. 6.00) . The membership fees (per person) read as follows: one day (Monday to Friday) S/. 26.00, one day (Saturdays, Sundays, public holidays) S/. 39.00, two weeks (15 consecutive days) S/. 221.00, one month (30 consecutive days) S/. 442.00 (please note that the EDEAQ cannot guarantee the accuracy of these preferential rates, and that the availability of free places is limited/caannot be guaranteed). Please be informed that the “Club Internacional Arequipa” will charge a modest additional fee for the use of some of its facilities. – Facilities include swimming/use of pools (indoor and outdoor), tennis courts, gymnasium/ aerobics, soccer, fulbito, volleyball, basketball, track and field, etc. Well worth mentioning: the most prominent offspring of the “Club Internacional” started his career as a ball boy at the tennis courts of the “Club“. 14 years after he had asked to borrow his father’s tennis racket, Arequipa-born Alejandro Olmedo, in 1959, defeated the Australian Rod Laver in a legendary final (6-4, 6-3, 6-4) to become the first Latin American to win the Wimbledon Tennis Tournament. In the same year, “Alex” Olmedo (“el Cacique“) won the Australian Open (defeating Neale Fraser) and the Davis Cup (as a member of the US team). The EDEAQ is a Spanish Language School and does not have a Tour Operating Licence and therefore lacks the corresponding insurance coverage. For that reason, the EDEAQ does not organise tours or excursions. But the EDEAQ is, of course, in a position to provide you with information about reliable tour operators, guides, service providers, etc. and to establish pertinent contacts. The same goes for information on other leisure activities (dancing and cooking classes, yoga, music lessons, etc.). – Sports options (outside the “Club Internacional”) include trekking, mountain climbing, hiking, river rafting, kayaking, mountain biking, etc. Before you book and pay something (plane or bus ticket, weekend excursion to the Canyon de Colca, etc. ), we recommend that you contact the EDEAQ in order to get pertinent advice. Please note that the EDEAQ, in co-operation with the Hostal Los Andes, runs an Information/Sales point (which is located in the entrance lobby of the Hostal Los Andes/of our School), where you can get competent advice (trekking, mountain climbing, excursions, sports, bus and plane tickets etc.). – Before you rent a car through a travel agency at home or on-line, we recommend that you contact the EDEAQ in order to get pertinent advice, because we will most likely be able to obtain a significantly lower price. In Arequipa, there are two parallel systems of public transportation: “Combis” and individual taxis. Combis are small/mid-sized buses of different colours, circulating on set routes in and around the city. They are inexpensive (S/. 0.80 per ride), and most of the time jam-full/overcrowded. None of our students, however, has ever reported an incident in a combi, but we would nevertheless recommend to be very cautious/alert. Individual taxis are a common and relatively inexpensive mode of transport in Arequipa (and all over Peru) – most of them operate as part of officially registered radio taxi companies. You can identify them by what is written on their roof tops, which normally includes the name of the company and the switchboard phone number. Taxis are safe and – in particular for foreign visitors – of very good value (S/. 4.00 in the inner city, S/. 5.00 to S/. 10.00 to other neighbourhoods/ districts). Arequipa hosts an impressive number of restaurants, ranging from simple/inexpensive to rather sophisticated and (for Peruvian standards) fairly expensive. It is, however, not difficult to find popular but decent places where you can get a complete meal (often with a soft drink included) for anywhere between USD 2.50 and USD 4.50. – The label “menú turístico”, offered in many simple as well as middle class restaurants, although rather specious-sounding, is generally of good value and attracts not only “innocent foreigners” but also local customers. You will find prepared dishes (salads/starters, main courses, desserts) of excellent quality (Peruvian and Arequipean specialities, plus international cuisine) at fairly inexpensive prices in the food courts/takeaway buffets of the supermarkets near the School (El Super, Plaza Vea, Franco, Tottus, etc.). The food in Arequipa has achieved international fame. It has the greatest variety available relative to the rest of Peru and is distinguished by its fancy flavours, seasoning and use of “chili,” which is why typical restaurants are called picanterías. Arequipa’s food is so diverse that there is a different soup each day, presented as a broth or chupe (thick soup). 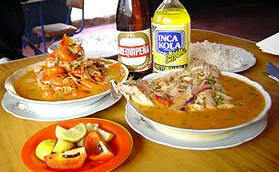 The most famous one is the Friday soup, the chupe de camarón (shrimp broth). The following dishes, based on either shrimp, pork, guinea-pig, or cheese and hot pepper, are among the most well-known: ocopa arequipeña, rocoto relleno, adobo de chancho, soltero de queso, pastel de papa, costillar frito, cuy y conejo chactado, cauche and chaque. For dessert, the queso helado is recommended (which has nothing to do with cheese, but is just a delicious type of ice cream made up of milk, egg yolks, sugar, cinnamon and vanilla), as is drinking the chicha de jora, the local beer or anise of the region. The solid quality of Peruvian wines (red, rosé and white, either dry or semi-dry) has to be mentioned as well. The best-known labels are Tacama, Tabernero, Queirolo and Ocucaje. And, as everywhere in Peru, a delicious meal starts with the national cocktail, the pisco sour, a long drink based on “pisco” (grape brandy), lime juice, crushed ice cubes, sugar, egg white, and ground cinnamon or a few drops of “Angostura Bitters“.